Businesses are increasingly getting into video as a medium to market themselves and their brands. Platforms like Facebook Live, YouTube, and Instagram allow you to broadcast live video streams to connect directly with your audience and create your own TV show. But the questions are, “how do you make professional looking videos?”, “should I use freelancers or do everything myself?”, and “what tools do I need to get it done?”. 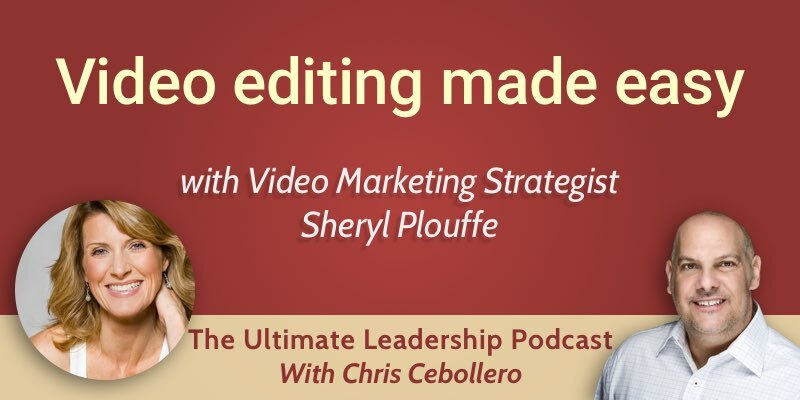 It’s time to bring back our resident video expert, Sheryl Plouffe, who loves questions about taking what you’re already doing and incorporating video. Sheryl dispels myths about the complexities and time constraints of video editing. You can shoot and edit video on-the-go with your smartphone or tablet. This can be an incredibly effective use of time, enabling you to record, edit and share your content from anywhere. For example, Sheryl edits video content on her phone during with her son’s hockey practice! It’s faster – once you get used to the workflow and the process of editing becomes automatic, it gets really fast. Whereas with outsourcing, the turnaround time can be much longer. You have complete control of the branding – you can, of course, instruct a freelancer or employee how you want your message to be communicated, but that’s much simpler when you are completely hands-on with the process. A tip for simplifying the editing process is to write and practice your script so that you record your 2-3 minute video in one take. This means you have much less editing to do. Sheryl encourages us to consider what kind of content we are creating. If we are making long-form, sales page content that is highly scripted, you may want to outsource the editing to ensure you get it looking professional. But for in-the-moment, authentic 2-3 minute videos you are making on a daily or weekly basis, it can be better to do it yourself for all the reasons mentioned above. Sheryl suggests a couple of apps that can make editing video yourself simple. If you are looking to outsource, Sheryl recommends contacting your local school or college to see if there are students looking for video editing work. Freelance marketplaces like Upwork and Fiverr are other great places to source video editors. Join Sheryl’s Facebook Group, Personal Brand Breakthrough for a community full of resources and tips to using video to communicate your brand online.